An audiobook bundled with resources, so you can begin addressing unconscious bias in your everyday practice. This bundle goes beyond the challenges of recognizing bias. It shows what you can do about it. 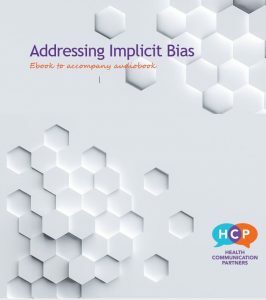 This bundle of resources will help you to address implicit bias in your own language, and take steps toward addressing bias in your organization. You download them. They’re yours. It’s exclusive – I made it just for you – and its flexible format keeps it user-friendly. So you can learn and work on your own schedule. The PowerPoint show may also come in handy for those who are leading others in examining their own implicit biases.